A vintage touch for your art and craft projects! Love the collection and colours. Such a great variety! So much care taken! Arrived on time. Thank you! Orders are packed/shipped Monday-Friday 8:30-10:30 am CST. I can be reached via Etsy message or e-mail Monday-Friday 8:30 am - 5:00 pm CST. for questions. I will answer as soon as I can! How the stamps sets are packaged? All stamps are packaged in a archival quality glassine envelope within a card to protect them on their postal journey to you. Item(s) will be shipped in a regular envelope. Standard delivery is first class in the U.S. and orders from Europe. Shipping is done two business days after the order has been received/paid. In the U.S., you can expect to receive your order within 3-4 working days of shipping. For International orders (EUROPE), delivery can be expected within 7-10 working days. Delivery times at Christmas and during other Public Holiday periods may take longer. Unfortunately, this is outside of my control and some orders may take longer to arrive. If you have not received your order within 10 days (US) or 28 days (International), we may need to submit a claim to the USPS. Tracking is not included in standard delivery. For most items, I offer an option to upgrade your shipping to include tracking. Combined shipping is available if more than one set is purchased in one transaction. YES, you'll receive a notification once the item has been shipped. What is the condition of the stamps? For sets identified as NEW, all the stamps in the set come with their original gum on the back; NO gum disturbance. You can go the old fashioned way before placing it on the envelope, or you can use a glue stick. 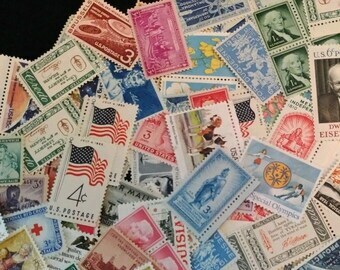 These stamps are in excellent condition and can be used for postage. If you are not completely satisfied - please return your order within 14 days and I will refund money less all shipping costs. Please, contact me first to see if I can resolve the issue. If it is my mistake - I will pay for the shipping expense as well. How do I attach the vintage stamps once I received them? In the U.S. until the mid-90s all stamps had a water activated adhesive; We recommend the use of a slightly wet cloth to activate the adhesive or if used on art projects we recommend the use of a basic glue stick, applying a thin coat of glue working from the center to each corner - one stamp at a time. Starting the late 90s most stamps only have a self-adhesive backing which does not require any additional glue. How to verify if a stamp is new or used? Stamps previously used have a cancellation mark on the front which may include the date and the city of origin. It can be the tiniest of black marks on a corner of a stamp. New "unused" stamps are clean and free of marks of any kind. All NEW stamps from our shop are unused and in excellent mint condition with the original adhesive on the back and are free from strong odors. All USED stamps from our shop are fair condition with or without the original adhesive on the back; some could have hinge remnants, and are free from strong odors. It is important to add that on some very old stamps a slight discoloration may occur. Do not place the stamps directly above or near a radiator or heating device or on any other hot surface. Please contact me if you have any questions/problems with your order.